you may wish to choose from to make your first bracelet. a Chain or Wrapped Loop Rosary. to fit a child wrist - 5 1/2 to 7"
Or large enough to fit an adult wrist - 7 1/2 to 8 1/2". The number of chain links, size of bead, and how far apart to space the beads will be determined by how small or large you wish to make your bracelet. This is when a Bead Board Comes in handy. to just the perfect size. The bead size depends on the overall choice of design for the Bracelet and is really a matter of personal taste. are shown only for illustration purposes, to help in choosing the right size accent beads or spacers you might include between the Pater and Ave beads of your Bracelet. you will need to attach a clasp. There are a number to choose from. The choice is up to you and your taste. Flat Lobster with Jumpring: This is a small delicate clasp most suitable for bracelets. Attach a jumpring to one side of your bracelet. Open the small ring on the flat lobster and attach the end portion of chain from the other side of your bracelet. Close the ring and "temper" by a gentle squeeze with flat nose pliers, until you can no longer see the split in the ring. Hook & Eye: This clasp can be store bought or you can make your own. This is a delicate easy-to-close clasp, and is suitable if your bracelet is especially dainty and lightweight. Lobster Claw with Jumpring: Another style of the lobster clasp, slightly larger and thicker. Attach a jumpring to the tiny ring on the side of the lobster claw clasp. Temper the jumpring as explained above. Attach a jumpring to the other end of the bracelet. Spring Ring with Jumpring: Probably the most popular and least expensive of the clasps. Open and close the spring a few times on the Spring Ring, to make sure it closes properly and completely. Attach with jumpring to end of your bracelet. Attach another jumpring to the other end of bracelet. Barrel Magnet: This style of clasp is relatively new, but works well as a clasp for your rosary bracelet. Attach with jumprings to both end of your bracelet. 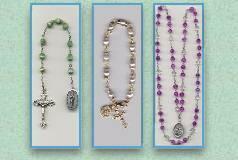 Somewhat heavier than the other delicate clasps, but easy to fasten, especially on a child's rosary bracelet. no matter how you twist and flex it. Rosary Supply or Bead Vendors. A child's rosary bracelet will use approximately 3.5 coils. But to begin, cut 4-5 coils. If you will be using large beads, and many separator beads, cut 6-8 coils. The memory wire will ruin the blade of your regular wire cutters. Special Memory Wire Shears are needed to cut this type of wire. A heavy duty household shear may work. Test first on the very end of coil to avoid waste. to a 90 degree angle. and it takes some effort to bend. Make sure you have a good grip with your pliers. When the loop is formed, use flat nose or chain nose pliers to press the cut end in close to the remaining wire. or beader's glue to the end of the memory wire. Hold bead in place until glue is tacky-dry. Dry thoroughly before adding beads to coils. Another choice is to use a crimp bead with crimp bead cover to secure the beads in place. Begin adding your decade beads, with or without separator beads, such as seed beads or rondells, etc. Be sure to separate the Pater Beads from the Ave Beads in some way, with chain, a rondell, or other embellishment, marking off the 5 ten-bead decades. Count your 10 beads twice. There's nothing worse than finding you haven't used enough beads once your bracelet is completed! as you did on the other end. You have less room to work with now to form that final loop. Form the loop first, and then cut off the excess wire with your Memory Shears. You may attach a small Medal and Crucifix with jumprings to the end loops, or to the wire itself if you have ended with a bead or crimp. Until you form that final loop to end the rosary bracelet, you can experiment with the beads to create any combination you find appealing. 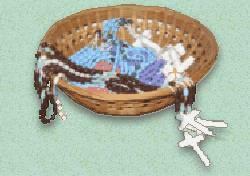 You may choose to use larger beads for the Paters, or add one or two seed beads between each Ave, and even more between the Paters and Aves.